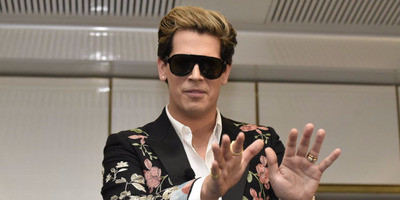 Michael Masters/Getty ImagesMilo Yiannopoulos in Australia. Milo Yiannopoulos’ former editor ripped the initial manuscript he submitted to Simon & Schuster. The editor took issue with Yiannopoulos’ sense of humour, logic, and writing style. Right-wing provocateur Milo Yiannopoulos’ book deal fell through after a tape revealed that he appeared to endorse sexual relationships with teenagers. But according to a manuscript revealed as part of Yiannopoulos’ $US10 million lawsuit against Simon & Schuster, editors had “substantial concerns” with the book’s tone and message to begin with. Simon & Schuster editor Mitchell Ivers, who has edited books by conservative figures including President Donald Trump and Fox News’ Tucker Carlson, criticised Yiannopoulos’ writing at length, pointing out logical fallacies in arguments, and saying that Yiannopoulos’ “ego gets in the way of authority” in certain passages. Ivers took issue with how Yiannopoulos covered subjects he was supposed to have some authority on. Moreover, Ivers seemed to find Yiannopoulos to be an un-humorous subject, urging the former Breitbart News blogger to cut jokes that Ivers repeatedly said were not funny, and telling him not to make cruel analogies like comparing liberals to school shooters. The right wing provocateur responded several hours later, claiming that the editor was flirting with him and including text messages between the two that appeared to show Ivers complimenting Yiannopoulos’ work. Yiannopoulos has undoubtedly had a difficult year. Yiannopoulos was forced out of Breitbart News following his comments about pedophilia, and was forced to cancel a major event he planned at the University of California-Berkeley.